The 4th edition of the Mulki Sunder Ram Shetty All India Basketball Tournament is currently underway at the Sree Kanteerava Indoor Stadium. The tournament is being played from 31st January to 4th February and features India’s top men’s club teams such as Vijaya Bank, Indian Overseas Bank and Income Tax. Lighting of the lamp at the inauguration ceremony. 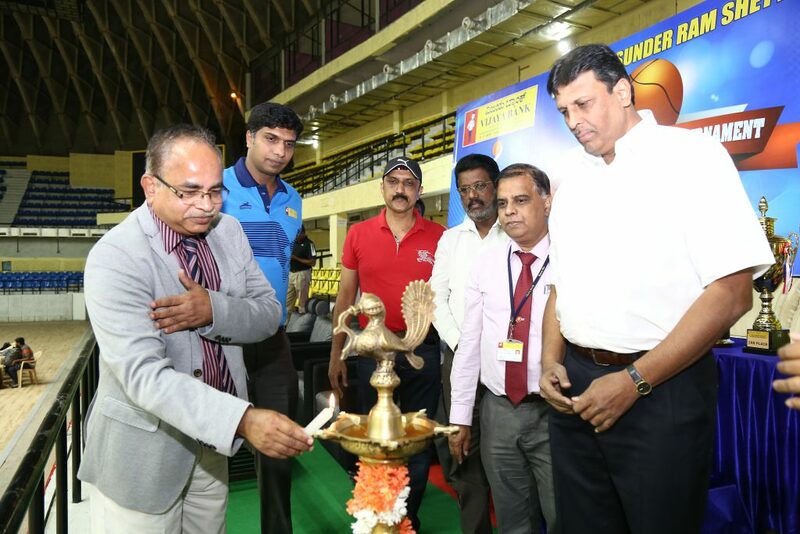 Bengaluru, 1st February 2018: The 4th Mulki Sunder Ram Shetty All India Basketball Tournament, organised by the Vijaya Bank, is currently underway at the Sree Kanteerava Indoor Stadium. The tournament is being played from 31st January to 4th February and features some of India’s best men’s club teams showcasing India’s top basketball talent. Income Tax beat Integral Coach Factory, 67-63. After registering a comfortable victory in their previous encounter, Income Tax looked to maintain their perfect record against a gritty Integral Coach Factory. Akilan Pari suited up for the Income Tax team after missing their last game against Karnataka Men. Early turnovers by Pari were capitalised upon by the ICF team who ran the floor hard to score six straight points on the break. Income Tax immediately slowed down the pace of the game and got their size advantage into play, running sets exclusively for Rikin Pethani and Ravi Kumar. ICF countered the move by aggressively doubling the big men who coughed up the ball multiple times for easy layups on the other end. The quarter ended 22-11 in favour of ICF. Income Tax regrouped during the quarter break and attacked the ICF 2-3 zone with precision. Rikin Pethani was the sole focus of the offence who displayed his play-making ability by setting up teammates for open jumpers. ICF’s point guard Anto Bethle coughed the ball on multiple occasions and Income Tax capitalized on his errors to cover the deficit. A quick time out helped Bethle, snap out of his funk, who then pushed the tempo to earn easy buckets for his team. P Vijay made his presence felt by grabbing offensive rebounds in quick succession and won valuable second-chance opportunities for his team. ICF managed to push through and enter the half with their noses in front, 38-31. The 3rd quarter began with Akilan Pari on the bench, who seemed to have tweaked his knee during play. Income Tax went right back into the paint to Pethani, whose post moves could not be contained by the ICF frontcourt. The two-headed dragon of Pethani and Ravi Kumar was nearly unstoppable as they rallied the Income Tax charge. Not to be undone, ICF, behind its point guard Bethle, traded buckets at equal intervals. The quarter ended 55-51, with Income Tax earning a slender lead. ICF opened the final quarter with a new plan of attack. Bethle drove hard at the heart of the Income Tax defence and dropped the ball off to his big men for easy baskets. Good ball movement helped ICF cut the lead down to one. With under three minutes to play, Seenivasan of ICF blew a wide-open layup and that miss was capitalised by Income Tax’s Ram Kumar who nailed the three-pointer. Tempers flared as the clock winded down and Rikin earned himself a technical foul, which happened to be his 5th personal foul, and was forced to the bench. Bethle of ICF nailed his free throw and on the following possession, Mukunth missed two wide open three pointers which would have tied the game. Composed play going forward and some clutch free throw shooting by Bopanna, meant that Income Tax came out victorious. After winning their maiden title in the previous edition, hosts Vijaya Bank, led by internationals Anil Kumar BK and Arvind Arumugam, opened their title defence against a veteran RCF Kapurthala (Punjab) team in the first game of the tournament. The game opened with a three pointer by Arumugam. Right from the tip, the game was a fast-paced affair with both teams frequently committing turnovers while looking to find their feet in the game. The pace helped a relatively young Vijaya Bank squad which ran up and down the floor scoring on fast break opportunities. RCF Kapurthala tried to establish an inside presence but committed frequent turnovers which played into the hands of the Vijaya Bank defence. But a couple of three pointers by Balbir Rathore of RCF Kapurthala, cut the lead and the quarter ended 20-19 in favour of Vijaya Bank. 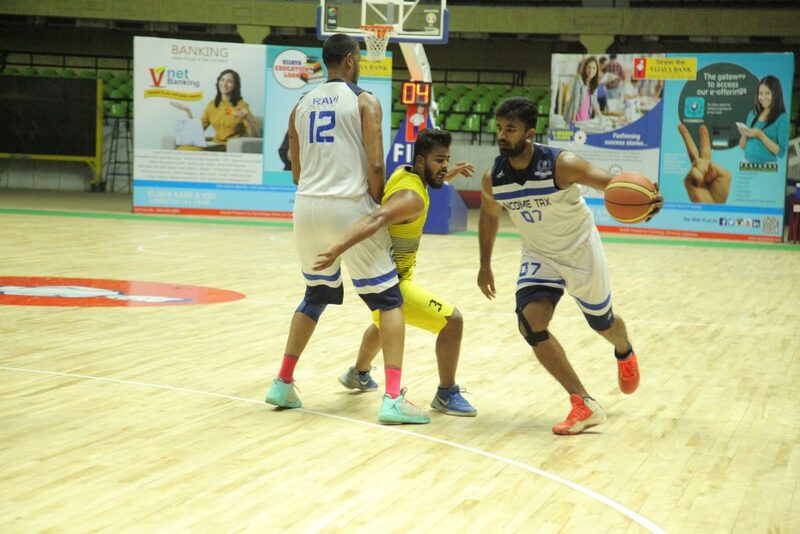 2nd quarter began with Vijaya Bank trying to establish their inside game by playing through Arvind Arumugam. The team fought relentlessly on the offensive boards. Anil Kumar BK, another Indian international from Vijaya Bank, joined the party by nailing a three pointer. Vijaya Bank also employed pressure on the ball which led to RCF Kapurthala coughing up turnovers on frequent occasions. The quarter ended with a 17-point lead in favour of the Vijaya Bank, 47-30 at the half. RCF Kapurthala changed their approach in the 3rd quarter. The team began cutting for open layups and began playing inside out against the Vijaya Bank defence. Ball pressure by the RCF defence helped them get back in the game. Centre Jaskaran Singh was a much bigger factor as his inside presence collapsed the Vijaya Bank defence. However, Vijaya Bank on the back of Anil Kumar and Arvind Arumugam did just enough to stay ahead. The quarter ended 58-54 in favour of the hosts. With the game hanging in the balance and everything to play for, Vijaya Bank started crashing the boards. Sanjay Raj scored three consecutive baskets for the hosts to increase their lead over RCF Kapurthala. Fatigue was showing on the faces of RCF Kapurthala and the hosts made the most of it as they pushed the pace. Foul trouble meant that the game ended as a slug fest with Vijaya Bank coming on top 76-71. Praveen Kumar of ICF holds off Heriram of Chennai Customs to lay it in. The final scoreline of the game does not do justice to the effort and the energy put in by the players on the floor. While it appears to be a comfortable nine-point victory for the ICF on paper, the Chennai Customs team fought hard right until the last two minutes of the game. The game began at a much better pace than the one preceding it with both teams executing their plays to perfection. P Vijay of ICF led the scoring charge for his team by establishing his post-game and crashing the offensive glass on every possession. 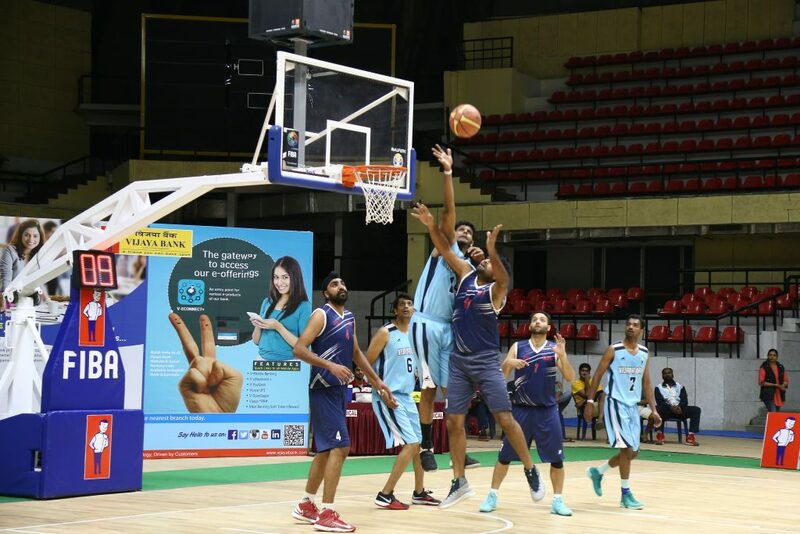 His offensive charge was matched by Justin of Chennai Customs whose timely scoring meant that the game entered halftime with a slender three-point lead for ICF, 36-33. On the other side of halftime, Chennai Customs fed the ball to India international Hariram and ran the offence through him. Chennai Customs began to move the ball more fluidly around the perimeter which led to a couple of easy buckets in the paint for Justin. Not to be undone by this, ICF began to push the tempo and got out on breaks for easy buckets. 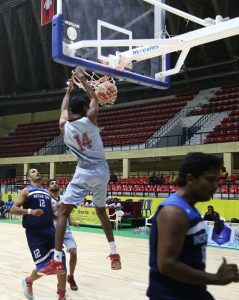 P Vijay’s scoring was adequately supported by his teammate GA Anto Bethle who dropped 13 points of his own. The strategy to push the pace seems to have paid off for ICF as their opponents Chennai Customs appeared to have run out of gas with just under two minutes to go. The ICF team increased their lead on fast breaks and ended up as winners, 73-62. The game was nothing short of a clinic and a great learning experience for a young Karnataka squad who was on the receiving end of a thumping. A veteran Income Tax team displayed intricate passing, positioning and play calling and brushed aside Karnataka who seemed a bit out of place. The young bucks of Karnataka put on a much better display in the second quarter. The team pushed the ball out on the break and scored a couple of easy buckets on two-on-one opportunities. The score at halftime read 30-18 in favour of Income Tax. The third quarter was much more free-flowing as the Income Tax team let their guard down. Karnataka made the most of it by scoring 18 points in the quarter but frequent turnovers on forced passes meant Income Tax scored 20 points of their own. The score at the end of the quarter read 50-36 in favour of Income Tax. The 4th quarter saw Income Tax big man Rikin Pethani and guard Ram Kumar head to the bench for a break. Karnataka made the most of this opportunity and pounced on an Income Tax team who got complacent due to its healthy lead. Karnataka’s pace up and down the court helped them get the game to within 5 points with 4 minutes to go for the buzzer. The run by the opposition forced Rikin Pethani and Ram Kumar back into the game. Income tax picked up their slack and turned it on in the final three minutes of play. The team ran its plays exclusively for Pethani who often scored on hook shots or made passes to his shooters when doubled. The final score read 68-56 in favour of Income Tax. 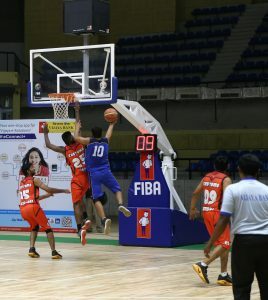 Notably, Vijaya Bank is the only recruiter of basketball talent in the state of Karnataka and has contributed 12 international players to the country, starting with Olympian Gurumurthy Dileep, who joined the bank way back in 1984. Other international players honed by the bank are former India captain BS Gautham (1986), A Rajkumar (1988), S Stalin (1993), G Murali Mohan (1995), Roshan Thankachan (1999), Austin JM D’Almeida (2001), Sanjay Raj (2002), Arvind Arumugam, Rajesh Uppar (both in 2012), Anil Kumar BK (2016). Including these international stars, in all, the bank has recruited 25 national level players, who have represented their bank and the state of Karnataka with great pride and gusto.